At this point I was still deluding myself that I was guiding the trek over familiar terrain, and that my experience would make the exit route easier than the '99 visit. This delusion was quickly shattered as I pointed out the trail along the lakeshore, noting that the 'real' trail must go further right since it passed by our camp last year further east than the lakeshore trail. This led us into large rocks with no path at all, and as we scrambled over this terrain I loudly doubted my sanity. Julie and I returned to the waterside path while Larry remained to the right as we climbed upstream to the first of Darwin Canyon's five lakes (we never did spot the '99 camp, much less another path). Larry joined us just below the lake, where we noted several foot-long trout trapped in a small pool on the stream. These were subsantially larger than our dinner the previous night, and it didn't seem fair that they would show up here! When we reached the shore of lake one, we took a break and prepared ourselves for the talus-hop around the lakes. The weather was cool but gorgeous, and no cloud would be seen this entire day. Larry and Juile watched me negotiate the first few rocks, and Larry said no-thanks and headed up a slot to the left. Another slap to my guiding prowess for this route, but I didn't like my route either, so I headed uphill with them. After cresting the low hill we could look down to the lakes, trying to find our next direction. The trail below us was less troubled by talus, so I descended to familiar ground while Larry tried to stay high and Julie took a middle route and joined me in a few minutes. The big talus drove Larry down as well, so we all met at the low end of lake two. 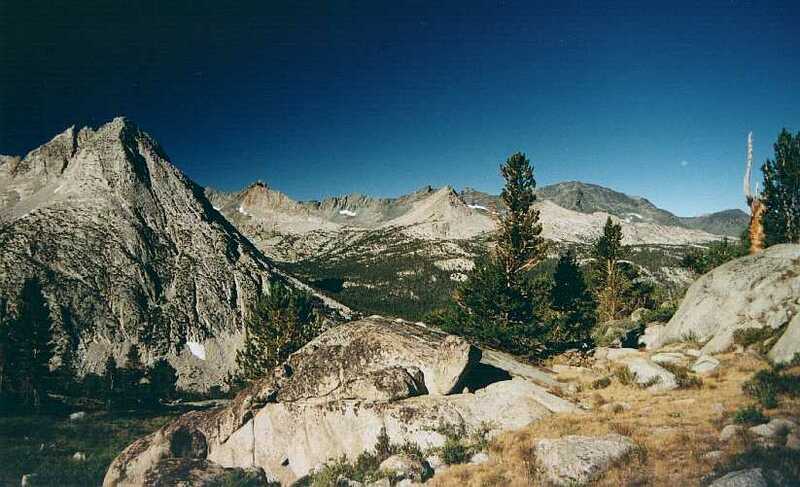 The second and third lakes were easily negotiated by the trail, and we rested again between lakes three and four. Here I noted that the route would get ugly for fifty yards or so, but no other route looked any better. We scrambled through the mess of huge rocks, reloaded our water bottles, and headed toward the turn between lakes four and five. By leaving my filter cover by the lake, Larry and Julie got a several-minute lead while I wasted still more time getting set to move. They were a hundred yards or so ahead of me when I shouted instructions as to where the col was on the skyline. This careless comment was costly, as my description was given from a point nowhere near their view; my 'pyramid-rock' guidepost was not the same as theirs and they veered to the left. 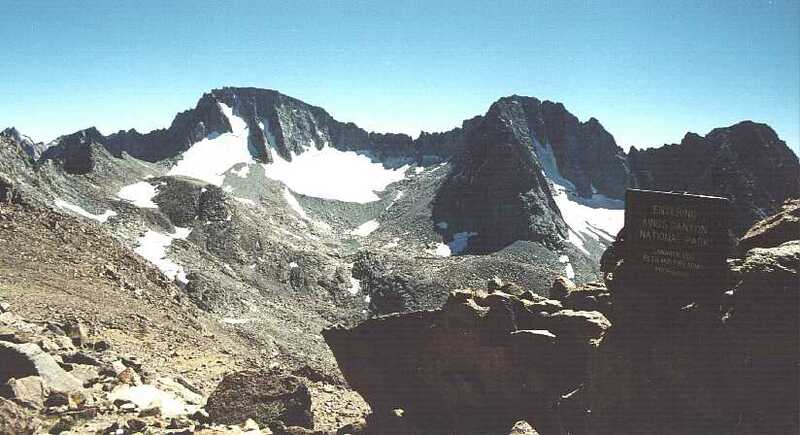 They hit big rocks and slowed down, allowing me to catch up a bit and ask why they were so far left: their answer clued me in to my careless instruction, and we all swerved back to the right over a rough and rocky ridge. The route continued to be more elusive than the previous year, as good pathways in the sand led to more huge talus, but we continued upward at the best pace we could manage. Two hikers were working their way down from the col, taking a route more to our right; just as we considered going that way we saw them working through a tough stretch and decided to keep on our course. Finally, well after 2PM, the narrow notch that is Lamarck Col greeted us - from here the path would be much more visible! We had plenty of miles to cover from the top, and the chill breeze was not conducive to a long delay, so after fifteen minutes of dining and photography we were under way again. The permanent snowfield that reposes under the northeast lip of the col was larger this year, and the suncups were impressive; a good twenty minutes was spent carefully sliding down to another high, sandy valley that is much less steep than the side we had ascended. We then shifted into a higher gear, working our way down the long valley toward Grass and North Lakes, now visible in the near distance. 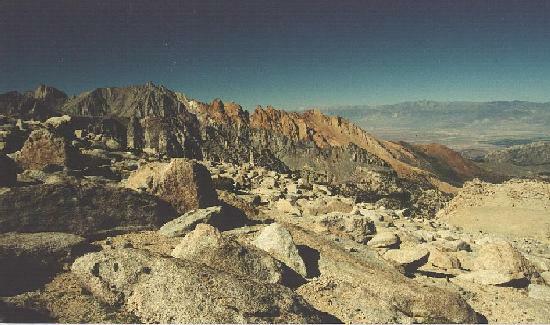 The view to the northwest was a psychadelic display, with the rusty red Piute Crags contrasting mightily with the greys and off-whites of nearby ridges and distant Humphreys. We lost the trail once again near the bottom of the valley, but this time I knew that the trail visible to the left was the proper route. Shortly after that came the 'vertigo path', where a brief slip could induce heart failure and a fall would last a long time. We hustled carefully through here, then began down the long switchbacks above the Lamarck Lakes trail. I stopped at the top of the switchbacks to change film in my camera, began to descend, then slipped and skidded to a nerve-wracking stop a short way down the slope; as a result I fell behind the other two. Larry decided to speed up some more and bring the van to the trailhead, saving us a bit of time. This was a good idea gone wrong, as he took the abandoned trail to lower Lamarck Lake and had to wait for us to pinpoint the real trail's location in front of him. He climbed a spooky cliff and rejoined us, then sped off again as Julie and I worked down the switchbacks above Grass Lake. While my leg was far less damaged than the previous year, the long day was slowing me down a great deal on the downslopes, so Julie put a bit of a lead on me. This final stretch seemed interminable in '99 and if anything seemed worse this time, so I was glad to hear the two of them ahead of me: done at last? I was not alone in feeling this trail had gone on too long: they were resting on the trail, and Larry suspected that we were on the wrong trail. Surely it shouldn't take this long to travel a few short miles! I reassured him that this was the right way, that it seemed infinite but familiar to me as well, and we continued on together. It seemed like only a few short decades later when we reached the picnic-table that Scott had collapsed on the previous year, and soon afterward we reached civilization again. Larry went down to the van while Julie searched in vain for the beer that Larry hid in the creek a week before. The van pulled up, we dumped our gear in back, and Larry found the beer. After that tasty treat we hit the road, pulling into Bishop at dusk. We had just put in a 12-plus-hour day, and we were clearly exhausted - and HUNGRY!